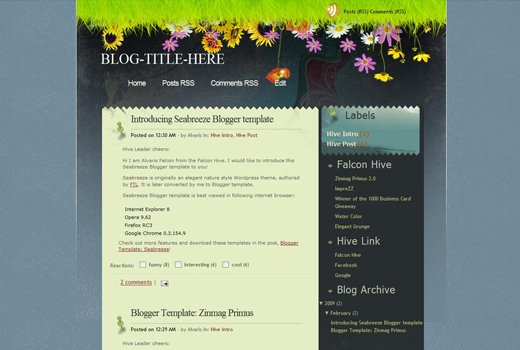 Sea breeze blogger template for free download on Blogger Templates. I like this one very much, but the labels, which are at the top of the post, run together with the text of it. Is th anything I can do to fix this. I would really like to use this template. Thanks! Your download is a zip file that won’t open. Also, your “installation and settings” tells us nothing about installing and settings. Are you using winrar, 7zip or winzip to unzip the folder? For installation you just need to go to your blogger dashboard -> Layout -> Edit HTML and upload SeaBreeze/xml file and your good to go. Sowieso warum nicht.. Das Tor gehört zu 70 % mir und zu 40 % dem Wilmots. have been visiting ur website for several days. really like your posts. btw i will be conducting a report concerning this topic. do you know other websites or maybe forums that I might get more information? thanks a lot. “Your template could not be parsed as it is not well-formed. Please make sure that all XML elements are closed properly. XML error message: Content is not allowed in prolog. Ok, sorry about the previous post, I got it to work now, only problem I’m having is my settings are all messed up, everything’s out of order and I don’t know how to get it normal again. I tried wading through the html or whatever, but I couldn’t find any of my titles which is what I usually use as a reference point for making changes, since I’m illiterate when it comes to all that stuff….